GtkRadioButton implements AtkImplementorIface, GtkBuildable and GtkActivatable. Example 10. How to create a group of two radio buttons. When an unselected button in the group is clicked the clicked button receives the "toggled" signal, as does the previously selected button. Inside the "toggled" handler, gtk_toggle_button_get_active() can be used to determine if the button has been selected or deselected. Sets a GtkRadioButton's group. It should be noted that this does not change the layout of your interface in any way, so if you are changing the group, it is likely you will need to re-arrange the user interface to reflect these changes. 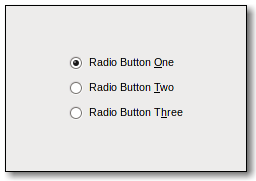 an existing radio button group, such as one returned from gtk_radio_button_get_group(). Contains only private data that should be read and manipulated using the functions below. gtk_radio_button_group is deprecated and should not be used in newly-written code. Deprecated compatibility macro. Use gtk_radio_button_get_group() instead. Another way of offering the user a single choice from many.